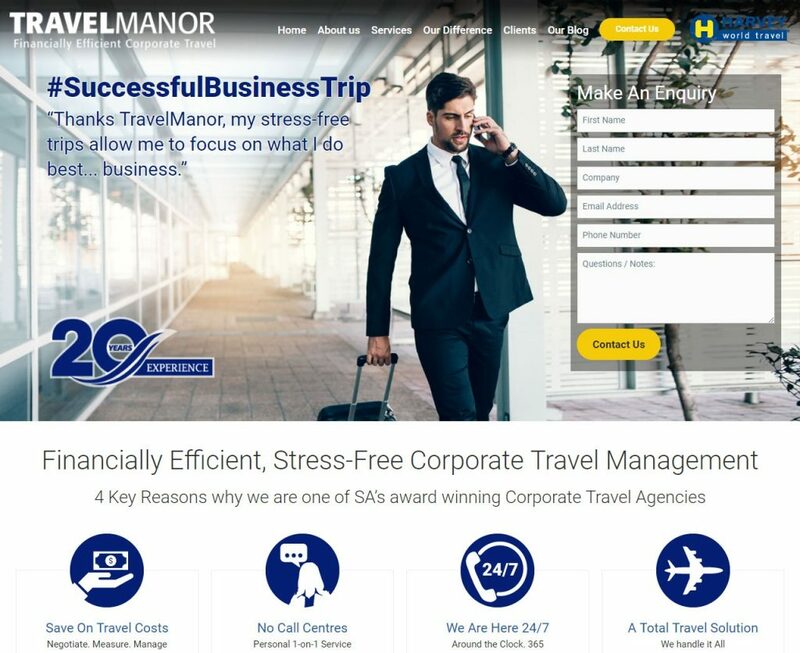 TravelManor is a corporate travel agency that excels in tailoring cost-effective, stress-free travel solutions for corporate groups and individuals. As a franchisee of the Harvey World/Bidvest group, this forward-thinking business travel agency draws from a tried-and-tested supplier pool that allows them to negotiate extremely competitive flights, accommodation rates and transfers. Their core team is situated in Cape Town, South Africa, and includes 9 of the industry’s most seasoned travel consultants, who bring a combined 128+ years of expertise to the table. The homepage layout was revised for optimal conversion. Existing pages were adapted according to up-to-date keyword research to improve organic ranking and Adwords relevancy. Content placement was revised for optimal conversion. Existing images were replaced with high-quality images that were chosen to connect more effectively with the target market and existing website users. WSI started by implementing a 90-day test programme on the Google search engine, monitoring and adjusting the campaign weekly to optimise results. At WSI, we firmly believe in understanding exactly what your prospective and current customers need to know, and then using these insights to produce optimised content based on keywords that have already been shown to drive organic search traffic and conversions. The key lies in delivering this content in a relevant and compelling way to grow our clients’ businesses by seeding and promoting the content by means of a business’ social networks. To do so for TravelManor, the WSI team did extensive research to better understand the corporate travel industry, identify key issues within this industry, got to grips with the what companies look for in business travel agencies, and how agencies, in turn, are fulfilling the needs of their clientele. The next step was to craft authoritative blog posts on a monthly basis, prepared according to relevant and interesting topics that were the result of these findings. This included topics such as understanding and managing business travel risks; the importance of green due diligence in corporate travel; how Millennials are changing the face of business travel; innovate travel expense apps for busy jetsetters, and more. WSI also established a firm social presence for TravelManor, to serve as the foundation on which we could implement and publish the content marketing assets created in line with our online marketing strategy. These platforms include Facebook Business, Google+ Local, Twitter and LinkedIn. Having laid the groundwork for the business’ online presence in this way, we then proceeded with a personal LinkedIn Marketing plan for key team members. These campaigns focus on increasing connections with relevant contacts and then building on those relationships until such time as it’s appropriate to reach out and ask for a meeting. As part of the SEO campaign for TravelManor, WSI created off-site blogging platforms on WordPress, Blogspot, Tumblr, Postach.io and Weebly and shared relevant content across these platforms. This content was then syndicated across various social platforms to increase the reach thereof. TravelManor’s digital marketing strategy therefore includes a two-pronged approach. Firstly, a search marketing strategy, the purpose of which is to significantly elevate the business’ exposure, to ensure that they will be found when people are searching on Google for corporate travel agencies in South Africa; and secondly, the LinkedIn strategy, which comes down to good ol’ fashioned networking on steroids. We are confident that, in tandem, these two strategies will gain in momentum exponentially, and increasingly deliver the new business opportunities that the TravelManor team are keen to find. For SEO Services and Digital Marketing & Sales in Sweden, please contact WSI WebAnalys. Local, National, Global, and E-Commerce Search Optimization & Lead Generation. It’s great when we help our clients boost their conversions or generate more leads. But it isn’t the numbers and percentages that drive us – they’re important, don’t get us wrong, but we strive to make a difference in the lives of our clients. Whether it’s helping them generate enough revenue to expand to multiple locations, developing content to enable them to reach an entirely new type of customer, or mapping out a digital marketing strategy that delivers them an award-winning reputation, WSI is making a difference. We are the happiest when we positively impact the lives of our clients beyond their monthly KPI reports. INn’OUT, offers a completely new approach to Car Service with centres across the UK. Our comprehensive strategy and implementation resulted in new leads and sales. Need some proof? Check out the video below to see how one of our Digital Agency offices helped their client achieve a best-in-class reputation for the UK and has ultimately made a difference. WSI Making a Difference: IN n’ OUT Client Case Study Video from WSI World on Vimeo. Reputation is power and it’s extremely important that businesses know how to influence and project a credible brand image online. We have 5 invaluable strategies that’ll help any team build positive brand authority and crediblity for their business. Check out our short video with the 5 key components relating to brand authority. Examples of a digital marketing strategy that you will see more of in the future is video marketing – online video with personality – or what we call personalised marketing. You are using personalised driven data to build your brand authority and awareness. And, yes, content is still king! Content marketing is essential and if you are using a lot of different content in different social media channels and websites, then don’t forget to develop a content marketing plan. 5 Key Components for Building Better Brand Authority from WSI World on Vimeo. WSI is a digital marketing company with a strong international presence. Our Digital Marketing Consultants use their knowledge and expertise to make a difference for businesses all around the world. © Copyright © 2014 WSI. All rights reserved.